Termidor, Bora Care, Green Pest Solutions by Nisus and BASF. A full-service pest control provider, Bug Man has been locally owned and operated in Roanoke Valley since 1994. In 2009, Bug Man began offering pest control services in the New River Valley. Today we offer effective pest treatments across Southwest Virginia, including Roanoke, Blacksburg, Salem, Lynchburg, Christiansburg, Botetourt and the surrounding cities. Closed Crawl Space Services in Roanoke, Lynchburg, Harrisonburg, Charlottesville, Richmond and the entire state of Virginia. Daniel, does a through job each and every time he visits my place. He is a very personable young man, and pleasure to see! Gene Smith. Daniel is great! Office staff is always nice to deal with! Treatments are performed in a timely manner and have been completely effective. Our technician, Dwight Bush, is courteous, highly knowledgeable and a pleasure to work with. Great service, very flexible, met all my requirements.. Thanks. We have had Bug Man Exterminating treat our primary home for at least 10 years and now have them treat our vacation home as well. These people do excellent work! Daniel did a good job. pleased with the service. No more bugs! Thanks Cory for professional and friendly service. I appreciate the services of Bug Man. They can take care of anything buy. Thank you. Patty. 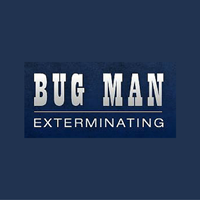 We at Cornerstone Builders Inc. have worked with Bugman Exterminating on numerous jobs and have always been pleased with the service. Great Company all the way from the salesmen to the technicians. Thanks Again ! Very Happy! No critters so far!!😄. perfectly content with the excellent service. Happy with results and the courtesy. Does a really good job. I am pleased with the service I received with the tech that came to my house. I haven't seen any mice to my knowledge, but am still seeing roaches. Very happy with this service. Their representatives are always pleasant, punctual, and do a great job. I recommend Bug Man. I was very pleased with Bug Mans professional work, their kindness, excellent customer service and I highly recommend this company to my family and friends. GREAT SERVICE! 11/2018 Rate 5 stars. Very pleased with our services. They were able to get out quickly and were professional and reliable. We are continuing to use them for anything that we need . Very satisfied from the technician to the administrative office. Thank you! Jenn Bird. Bug Man Exterminating Services has done an extremely good job for us. They are professional and very happy to help find a solution to all our bugs, ants and other “unwanted critters” that invade our home. I've been a customer for a number of years and am very pleased. I rarely see even a spider in my home. Plan to continue service as long as I live here. Love my Bug man. Met him through my employer. He is super professional and nice. I’m very pleased with the result of our issue with the bee nest in our house . Dawight I believe that was his name was very polite and nail the situation. Thank you for you help. We have used Bug Man for aortic. 4 years. Our Bug Man professional, Dwight, comes to our home. He is always extremely friendly and courteous to both myself and children. He listens to any problems or concerns that I may have concerning seasonal changes and extermination. He follows through on requests and provides easily understood explanations about those specific seasonal pest concerns. Bugman is the friendliest ,most dedicated team of exterminator services I have ever used in 3 decades. All of their pesticides are pet friendly and actually WORK. GREAT PEOPLE! fast service/ joey was the inspector who came to my house did a great job. We are very pleased with the service overall and like Dwight very much. Thank you for the excellent service you provide! They came quickly and solved the yellow jacket problem. Very professional throughout! Zack arrived on time, very courteous, answered questions and cleaned up driveway before leaving. We hope he returns to help lay the vapour barrier. We would recommend Zack to anybody. Also we want to compliment Brandon for his p.
Excellent service was given by the Bugman technician, Dwight, he efficiency exterminated a large wasp nest in my attic. Have been nothing but pleased with Bug man's service this far. Daniel is always pleasant and really knows what he is doing!